The architecture and Urbanism office “Kollektiv Stadtsucht” is an international, interdisciplinary and even an interactive company. 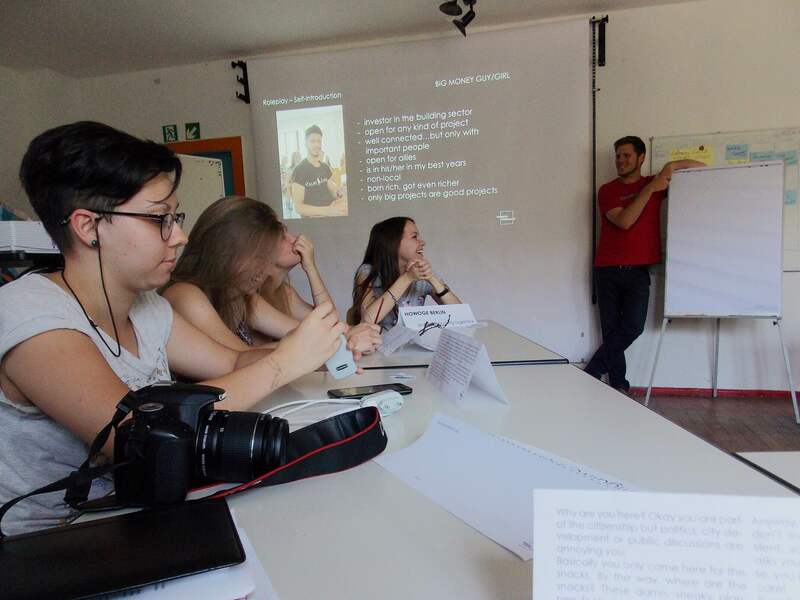 This interactive aspect was well shown during a workshop they have given to an international group of the workcamp “Urban Space”. Urban sustainability is a long discussed issue and due to the climate change it bacame even more important. Therefore the workshop dealt with the topic of “Sustainable Urban Development”. First, they explained the basic ideas of sustainability through ecological, economic and social aspects. The group of volunteers had an excursion around one of the Berlin districts which needs to be improved, Frankfurter Allee Neighbourhood. Then the volunteers had to find the solution of local problems as well as ideas for sustainable district development. The clue was here, that they had to make decisions not from their personal point of view but from the perspective of the role that was given them in advance. They had to play the role of a socialist’s member party, a craftsman, local retailer or an average citizen as well as mother nature. After that, they had an emotional discussion about how this district could be improved and new built. During the roleplay, the participants understood that it is quite difficult to find a compromise that everybody agrees with. Furthermore, it is neccessary to take into consideration different aspects of Sustainability.